If you haven't heard of The Angry Crab yet, remove yourself from under your rock, and listen up. Calling all seafood lovers. You must eat here. 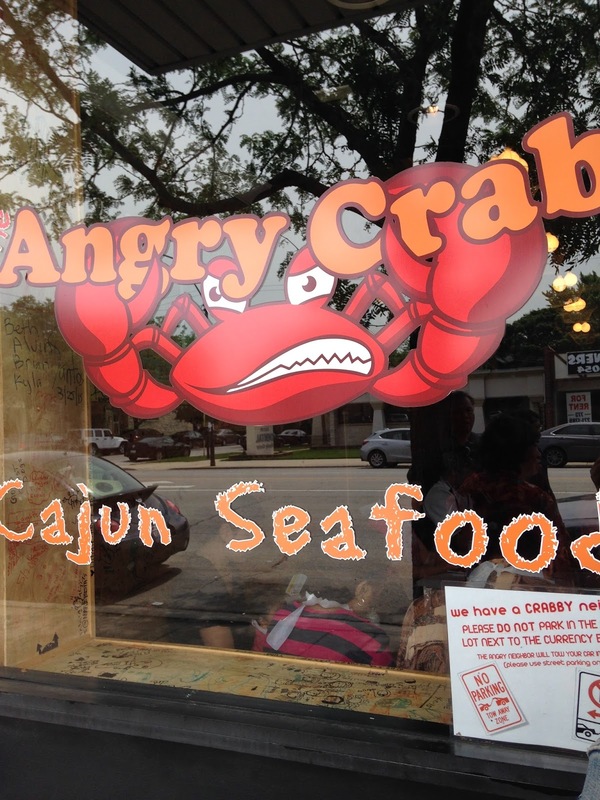 The Angry Crab, a cajun seafood joint, opened in West Rogers Park in March. It draws quite the crowd so be prepared for a wait, it's worth it in my opinion. Here's how it works. You put your name in and wait outside. I stopped by on a Saturday at 1:10pm, 10 minutes after they opened and had to wait one hour. My suggestion? Get there about 30 minutes before they open, which is 1pm on weekends, and 3pm on weekdays. Luckily it was a gorgeous day outside so my foodie date Emily and I waited outside. We were quoted an hour wait and they were exactly on target. The seating situation consists of some communal and private tables. We were asked if we minded sitting with another party (we did not) and that helped us get seated quicker. The vibe is very casual and you can even write on the wooden walls. Angry Crab has a pretty large selection of fresh seafood sold by the pound at market prices which change depending on what's available. The large chalkboard in front of the kitchen lists the daily offerings including clams, mussels, oysters, crawfish, blue crab and Dungeness crab, Alaskan king crab legs or snow crab legs, head-on or off shrimp, and lobster. The numerous options make it So hard to choose! But the selection isn't over there. After selecting the seafood you'd like, you select from one of three sauces your seafood will be cooked in: lemon pepper, garlic butter, angry spice or maniac, which is all three sauces combined. Trust me on this one, get the maniac sauce. You will want to drink every last ounce of it. Then you select your preferred level of spice from 1-4 and you can add extras to your seafood including sausage, corn, bread, potatoes, or steamed rice. 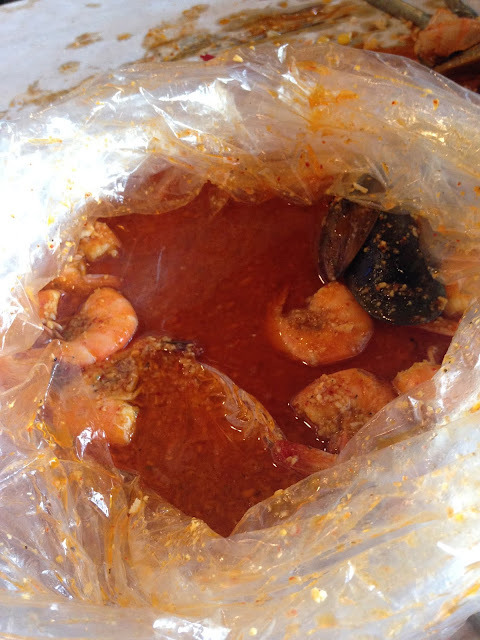 Everything is boiled in the spices and sauces and served in a plastic bag you unwrap at your table. 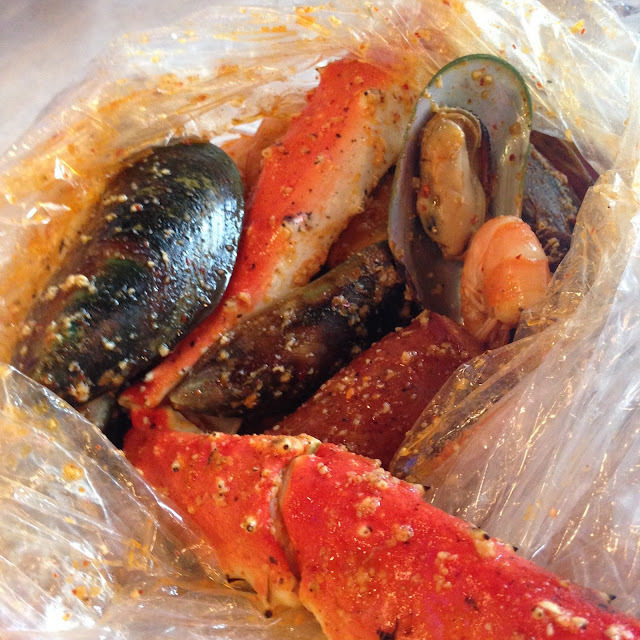 Emily and I ordered one pound each of Alaskan king crab legs, head-on shrimp (although they accidentally brought us headless shrimp), mussels, and sides of potatoes, sausage, corn, and bread, all cooked in the maniac sauce and level 2 spice. 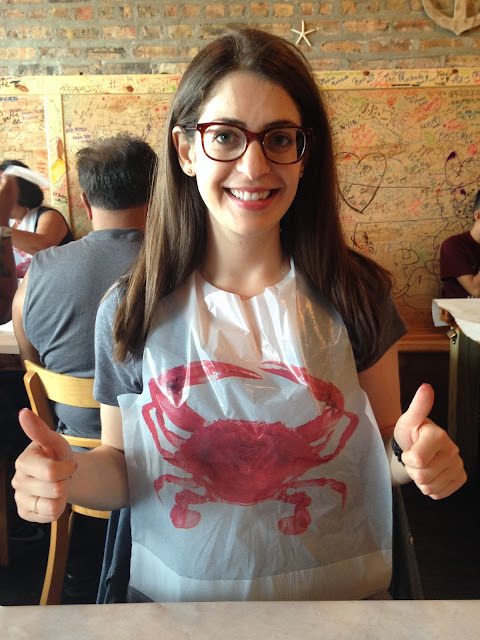 We tied on our bibs and awaited our bag of seafood. 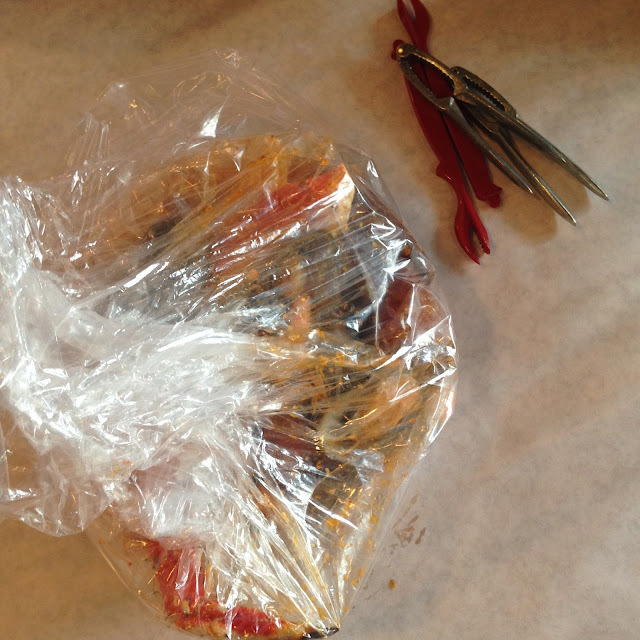 It didn't take long before our piping hot bag of seafood arrived at our table, along with tools to help us enjoy our crustacean feast. There are no plates necessary, you simply tear open the bag and go to town. Yes, you have to work for your dinner, but it is so worth it for that juicy seafood! There was so much seafood in that bag we both felt a little spoiled. And look at the size of those mussels! They were the biggest we'd ever seen. 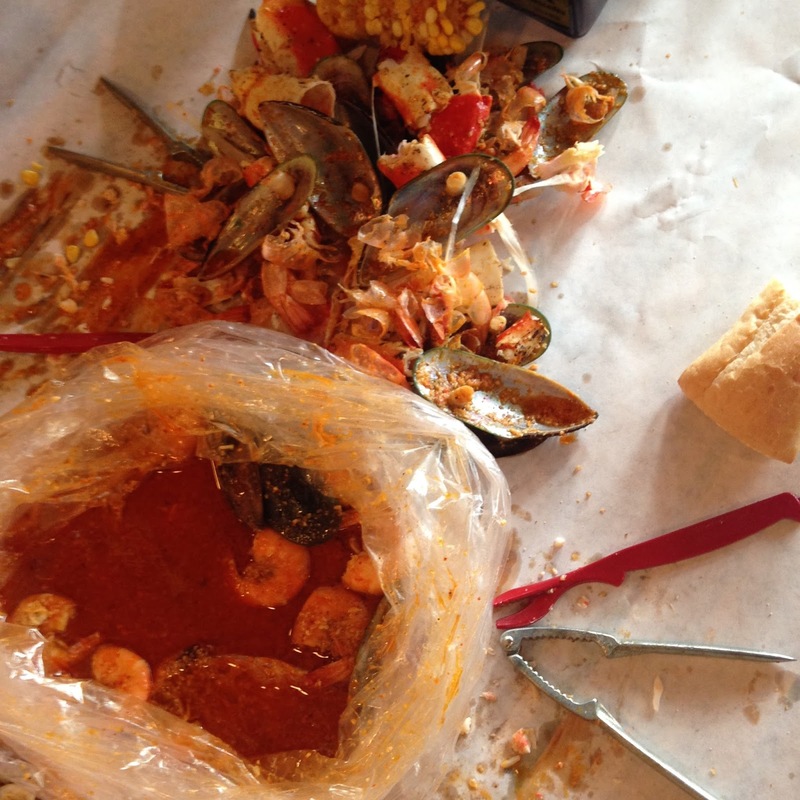 After digging our way through the seafood bag, we were left with a pool of wonderful maniac sauce. It was spicy, savory and buttery, and perfect for dipping our bread in. My only complaint was the bread looked like one of those Turano French rolls you get at the grocery store (and Potbelly's). The Angry Crab needs to step up their bread game! The bread is such an important sauce-soaking vessel! Yes, you get messy. Yes, you smell like garlic butter for several hours after. But the flavor and deliciousness is so insane, you won't even care. Consider it a little extra parting gift. Another plus is the hand washing station located near the back of the restaurant. After you're done eating with your hands, you can head back there and freshen up. No amount of paper towels would ever help after a meal like this, so this was a nice perk. Overall, The Angry Crab exceeded my expectations. I had heard a lot of hype about this place ever since it opened, but I didn't expect to like the food this much. For the quality and amount of seafood you get, I do think it is a good value. Plus it's BYOB so you already save on costs there. I recommend checking out The Angry Crab for lunch or dinner. Just arrive early and be sure to bring me with you! I'm giving The Angry Crab 4 ghosts out of 5! 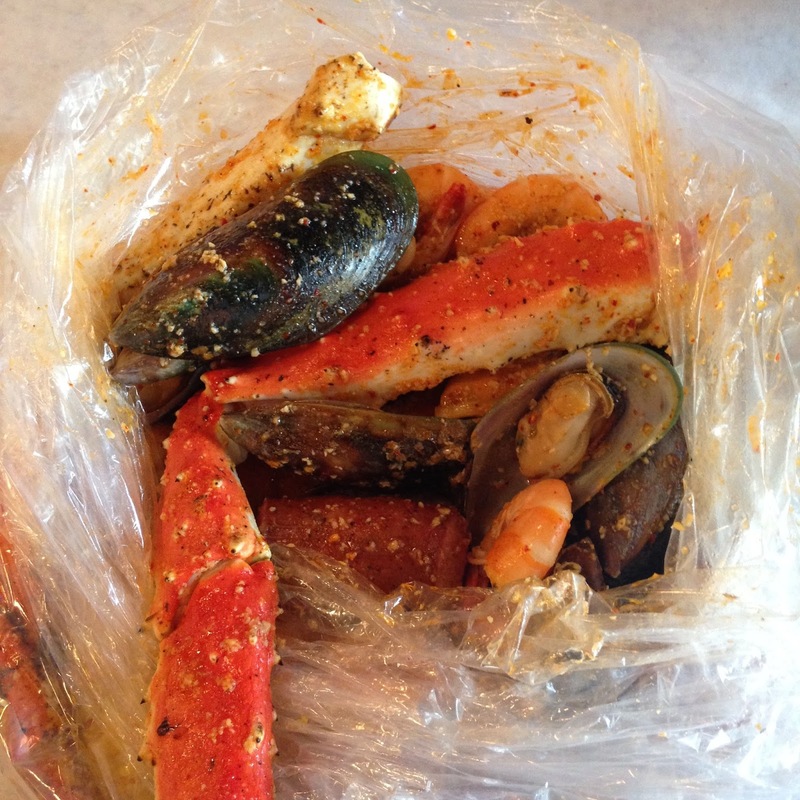 This reminds me of the Barking Crab in Boston-- so fun!